Enough to knock your caps off. She’s got 5 megabytes, Chuck. ’pparently IBM reckons they got no way to sell one with more. 6 bits for each character. With a parity bit! Takes only point-six seconds to locate a record. Imagine what you could do with that! In 1956 IBM launched the 305 RAMAC, the first computer with a hard disk drive. 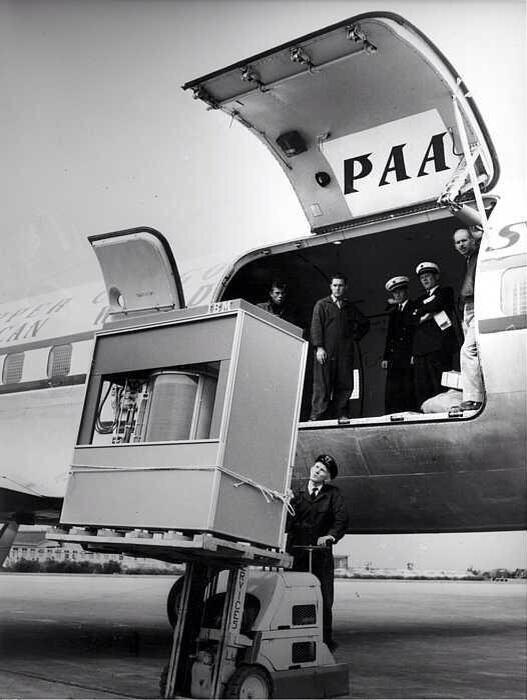 The hard drive unit weighed over a ton and stored 5 MB of data. It was moved about with a forklift and large cargo aircraft. Think of this next time you look at your 8Gb USB stick. My first computer with a hard disk was a IBM PC clone. Before that I owned an Apple ][e clone that used a consumer tape player as it’s external storage. My original source for the photograph was a re-tweet by @dgmacarthur of a tweet by Rich Powell (@cultmojo). It’s almost frightening how compact memory has become. From this behemoth and “No-one will ever need more than 64kB of storage” to a micro SD card that can hold 256GB (and growing…) on something the size of a fingernail. We are living in the future! You’re right there are larger-capacity cards – I used the 8Gb example as one even your typical home user would have.